More than 95 million photos and videos are posted on Instagram every day and I don’t need to tell you that a vast majority of these posts are mouth-watering images and videos of sushi, burgers, pizza, cupcakes, and other kinds of food and beverages. You may ask why so many restaurants are actively posting on Instagram. The answer isn’t far fetched. First of all, foods are “instagrammble.” The term instagrammable is a slang word used when something possesses the quality of being Instagram worthy. Secondly, Instagram has become a very powerful social media marketing tool because it delivers a wider reach than its parent company, Facebook. Thirdly, Instagram is a highly engaged platform, with 75 percent of users more likely to take action after viewing a post. Not to mention that posts on the platform generate over 4 billion likes each day. However, this post is not about telling you why you should be using Instagram. Instead, we will focus on what you should be doing on the platform to promote your restaurant. In today’s world, social media following is a very powerful tool and food bloggers know how to wield it to your favor and theirs as well. 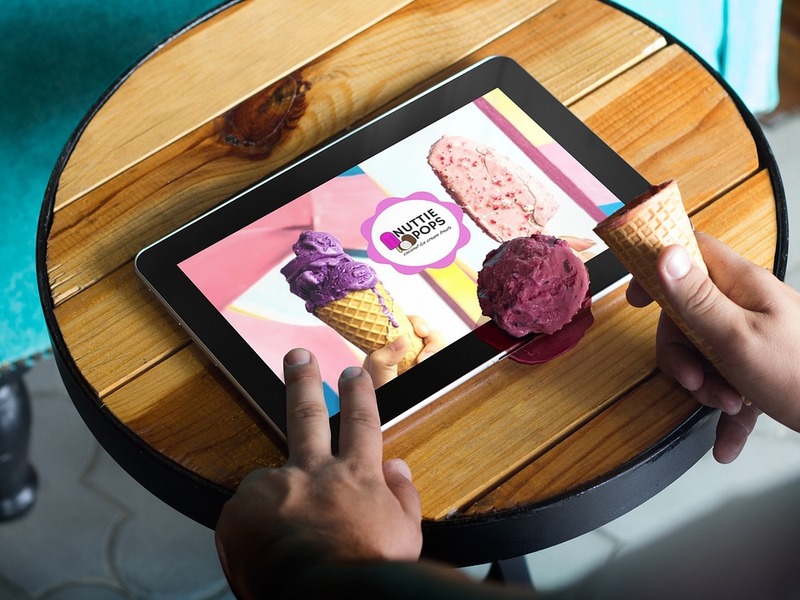 A single post by a food blogger can generate a lot of social media following for your Instagram account and foot traffic to your physical locations. Things get even better if you offer online delivery. However, expect a good food blogger with a loyal following of 30k and above to charge you some good amount of money. But you can also get some that would be more than willing to promote your Instagram account for free, just to get Instagram worthy food photos to entertain their followers. As a rule of thumb, go for food bloggers with 30k to 50k followers and choose ones whose followers live in your city. Your social media manager should be able to find the right influencers for your business. Hey there, like this page, tag someone you will like to share your winnings with and follow our page. Something of this nature is enough to get the attention of interested followers. 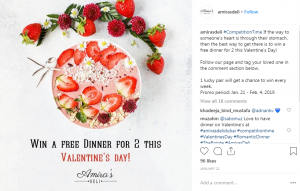 As you can see from the image above, Amira’s Deli was able to generate 129 likes and 41 comments. That is an amazing interaction for an account with less than 2k followers. Like I stated earlier, one of the amazing things about using Instagram is the organic reach. However, this isn’t possible without using the right hashtags. A study by simply measured found that Instagram posts with at least one hashtag have 12.6 percent more engagement than those without. And Instagram allows up to 30 hashtags per post, so use as many as you can. But make sure you are using the right hashtags. There is no one way to go about this but make sure you include the name of your restaurant, the food you are promoting, and the city in which your restaurant is located. And don’t forget to add the hashtag sign before the names. Make sure you monitor the tags that are performing well and use them often. To avoid making a mess of your post, post the hashtags as the first comment of every post. 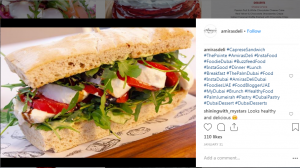 First of all, encourage your customers to tag your Instagram handle when sharing food photos and videos taken in your restaurant. This on its own is a form of micro-influencer marketing and testimonial. You can take a step further by finding the best of the tagged images and videos and reposting on your to your page. While you can easily post such images with requesting for permission, it will be polite if you inform the original posters, telling them how glad you are that they loved their meal and asking for their permission to share the beautiful images. Also, inform them that you will give them credit for the post. I bet you, 9 out of 10 will give you permission and will be happy to visit your restaurant again. Your restaurant’s Instagram bio should be beautifully crafted to showcase the concept of your restaurant. It should also have some call to action like booking or reservation number and your location. Again, you are allowed a limited number of words for the bio. Make sure you utilize the letters in a manner that conveys the most important points about your restaurant. If you would like to see better results with your social media marketing strategies, our marketing team at DB Hospitality can help you get there. Feel free to reach out to us, any time.